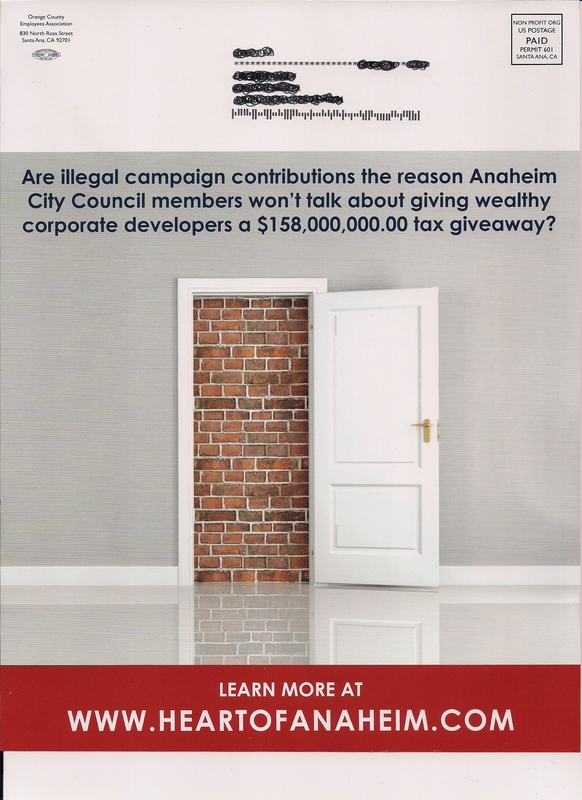 Things are really starting to get heated in Anaheim in a war between OCEA and the Anaheim Chamber of commerce over a City Council vote to give a tax break to a developer looking to build a hotel at the Anaheim Garden Walk. We first covered the story with a post that I made here talking about what had been taking place prior to us launching the blog. Chris Nguyen then had a blog post about a robocall that OCEA put out encouraging Anaheim residents to show up to a town hall meeting being organized by KABC 7. 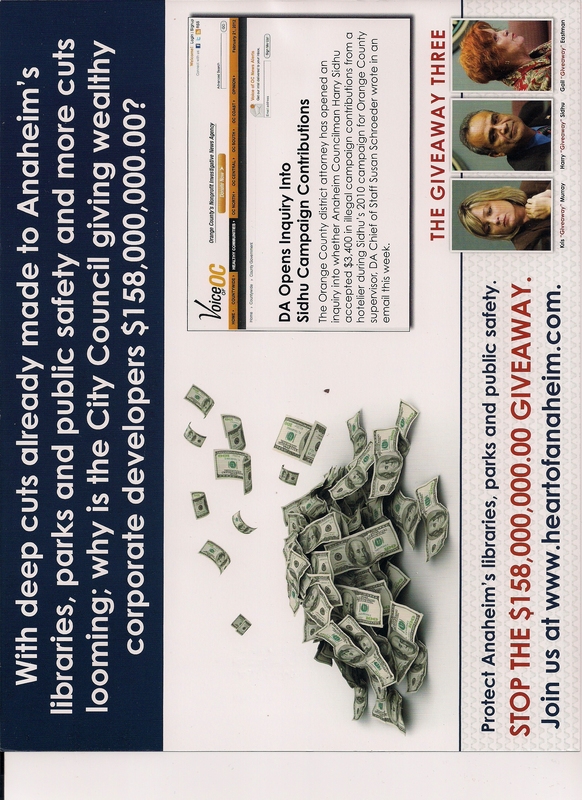 I followed up later that day with our first post of a mail piece that went out attacking the three Councilmembers. I then posted about the Anaheim Chamber of Commerce then fired back at OCEA with a mail piece that supported the three Councilmembers. Finally Chris Nguyen posted another robocall from OCEA that went out to Anaheim residents urging them to show up at the Anaheim City Council meeting that night. Now OCEA is back in the mail with another mail piece attacking Harry Sidhu, Kris Murray, and Gail Eastman. This entry was posted on March 1, 2012 at 11:03 AM	and is filed under Anaheim, Mail. Tagged: Gail Eastman, Harry Sidhu, Kris Murray. You can follow any responses to this entry through the RSS 2.0 feed. You can leave a response, or trackback from your own site. I can’t stand the OCEA, but that hotel subsidy vote was a gross handout to developers and it was unfair to existing hotels. We need the Hotels but not at that price. Please attend the Council meeting this Tuesday 4:30 PM March 6 and see if the Council will let the Voters of Anaheim decide.